Rancho del Rio is happy to take riders of all abilities and can even provide lead pony rides for children of 6 and under. 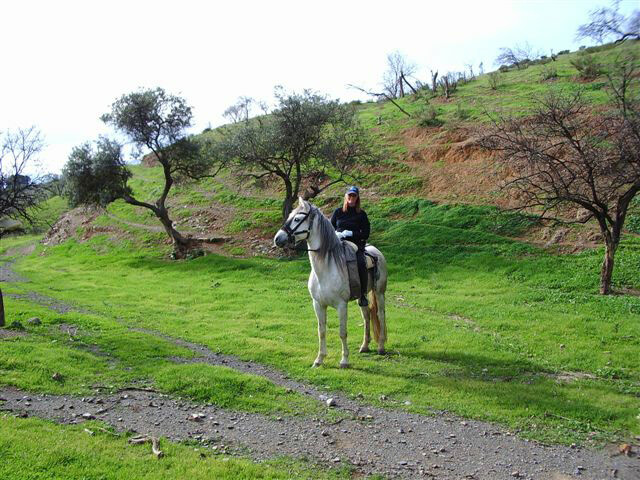 Rancho del Rio is located in the lovely Guadalhorce valley and is owned and run by Jane, who is herself a very experienced rider and teacher. Jane has competed for Great Britain, ran her own riding school in Oxfordshire, was involved in the Riding for the Disabled scheme and relocated to Andalucia 5 years ago. All rides are on genuine Andalucian horses with traditional Spanish saddles. Ride along the Guadalhorce river, enjoying breathtaking views of the Andalucian countryside, and enjoy the sights and sounds of nature at its best. Rancho del Rio caters for riders of all levels, offering bespoke riding holidays for small groups and arranging lessons and treks on request. Ranch del Rio is located next to the River Guadalhorce, five minutes out of Cártama on the road to Pizarra. Set in an ideal location you can enjoy riding in beautiful natural surroundings while still having easy access to the major towns of the Costa del Sol. It is about a twenty minute drive from the coast and Málaga airport and can easily be accessed by car. For those who prefer not to drive, Jane will be happy to collect you from one of the local train stations.